Leaves may not be turning yet, but the sun is setting sooner and sooner and washing the world in gold just before the night blots out the light. Branch out to Purple Peacock Jewels, Athenianaire, Life is the Bubbles and Beadmask for golden yellow jewelry for autumn. Oh là là! Purple Peacock Jewel's art nouveau earrings are so stunning they could stop traffic in Paris. 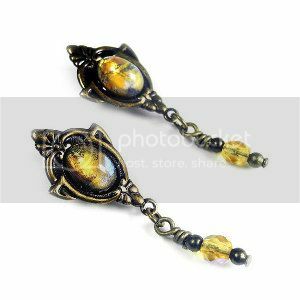 A tiny topaz glass opal cabochon is carefully mounted in each antique brass setting. The delicately decorative design is reminiscent of the art nouveau elements that one of my favorite artists, Alfonse Mucha, painted so intricately. The nickel-free earposts are embellished by small dangles with matching faceted beads. Athenianaire's real butterfly wing necklace will migrate any outfit from boring to beautiful. 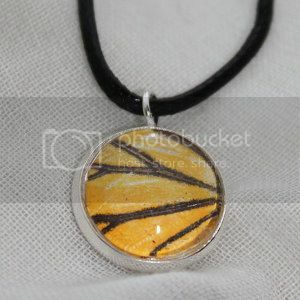 The lovely yellow pendant flutters from an adjustable lanyard in black. The pattern is preserved out of a Delias Hyparete butterfly wing from Thailand. The specimen was purchased from a legal conservation farm after natural death. No matter the season, buying this wearable art helps fund butterfly havens around the globe. Life is the Bubbles' fairytale magic bottle necklace will make you the most beautiful girl in town, just like Belle from Beauty and the Beast. The Disney-inspired pendant is filled with yellow glitter and topped with a red rose. 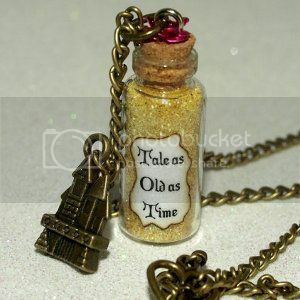 A bronze castle charm illustrates the "Tale as Old as Time" message. The bottle pendant hangs from a 19.5" chain that closes with a heart toggle clasp. Ever just as sure as the sun will rise, this is a lovely design! Beadmask's bead embroidered earrings will instantly spike an outfit's coolness factor. 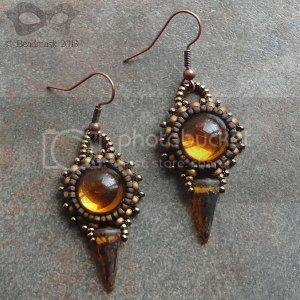 They feature vintage West German glass cabochons in a deep warm brown. The gleaming stones are surrounded with glass seed beads in matted shades of brown and bronze, backed with garment leather and hung from antique copper shepherd's hook ear wires. Tortoise shell spike beads dangle down to add a hint of danger to the design. I just love this color in jewelry! Like pocketing the sunshine! I love the art nouveau earrings, and my favorite Disney movie is Beauty and the Beast, so gotta love that necklace, too! I love the butterfly wing necklace. Lots of great beauties! You have some wonderful jewelry sponsors! The butterfly necklace is my favorite. Love the earrings, the bottles, wow, everything. So beautiful!